Dealing with cat kills can be a traumatic situation for young children, especially those with little or no experience of death. It’s hard for kids to look at their pets and see a killer, but giving kids insight into the feline mind can help bring understanding and acceptance into the picture. That precious furball who snuggles up in your lap, sleeps with you at night and purrs so loudly when stroked, who winds around your legs and looks up at you with such an adoring gaze has just showed up with blood all over her face. Even worse, she may have brought home a present of a bird or rodent to the dismayed, horrified child. Your kids don’t understand why their well-fed pets would need to hunt, or how the cats they love so dearly can be such cold-blooded killers of innocent creatures. An obligate carnivore and natural predator, a cat has been a hunter for a long, long time. When she sees something move, she follows her instincts and hunts it. She needs to retain her survival skills and keep them sharp, whether she’s well fed or not. After all, a meal out of a can or bag tastes nothing like a fresh kill, now does it? Plus, she brought home a gift to her beloved human family to show how she feels about them, so what’s with all the tears? For many kids, just knowing why their cat needs to kill is enough to ease their mind about the situation. Explain to kids that cats and kittens are like tiny lions. The whole reason that cats have claws and teeth shaped the way they do is because nature made cats to be effective hunters. Hunting is the natural way of life for a cat and how they have stayed alive all this time, nature chose this path for them so it isn’t by choice that cats hunt. Tell children about how all those delightful kitty behaviours, like pouncing on moving feet under blankets, chasing pieces of string or throwing a toy around in the air, are all part of this hunter nature. In other words, show your child the upside of cat hunting. Kids may still be upset with their cats, so make sure and tell your child that yelling at and scolding a cat does nothing to change the hunting habits and only serves to make the cat afraid of her human companions. 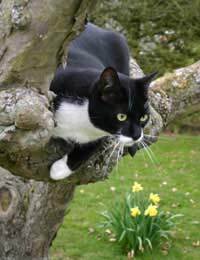 A popular solution to averting cat kills is a collar with a bell attached being put round the cat's neck.Unfortunately, this only works with some cats as many adapt to the jingle around their neck by learning to stalk without ringing the bell or adapting a ‘crouch and leap’ tactic that’s just as effective. Also, bells work on alerting rodents but birds tend not respond in the same way to the sound. There are types of sonic bell collars that seem to be more effective about warning birds, but cats can still learn to silence these as well. If your child remains inordinately upset and disturbed by the killing ways of your kitty, it might be time to make your cat an indoor pet. After all, it’s a much safer way of life for a cat, minus the perils of traffic, dogs, disease and other outdoor hazards, not to mention easier on the wild bird population in the area. You’ll have to put up with some pining and vocalisations at first, but eventually your cat will get over it. Bringing in some new, exciting toys and having frequent playtimes with your pet will make the transition smoother as well. Changing the times your cat goes out can also limit the amount of kills she makes, since nighttime, dusk and dawn is when the hunting is most lucrative for kitty. Neutering and spaying also helps greatly reduce the urge to kill in cats so make an appointment for your pet if this surgery hasn’t already been done.